Nature and wildlife education and conservation for everyone. About this Blog: Within the pages of this blog Earthshine Nature Programs’ naturalist Steve will keep you updated on the many projects and programs that we are involved in. Turtle Tracks is a unique wildlife conservation, research and environmental education program that is studying the Eastern Box Turtle. Since spring 2008 we have been continuously following several wild box turtles with mark-recapture and radio telemetry techniques in order to learn more about their seasonal movements, habitats used, habits and interactions with humans and our domestic animals. If you are adventurous, then book a visit with us at the Earthshine Discovery Center and journey out into the fields and forests with naturalist Steve on your very own turtle tracking expedition to find our resident box turtles Jimmy Irwin and Catherine (late spring, summer and early fall weekends and evenings only) . You will begin with a short lesson on the how and why of the project followed by instruction on how to use the radio telemetry equipment. Then you will take turns with the other participants to use the radio equipment to lead us to the turtles. On your expedition you will journey out into the forests and fields that surround Earthshine to learn what it is like to be a naturalist following a wild box turtle! Once we find the turtle we will collect vital bio-data, learn about about the life of the box turtle and how it is connected to all of the other creatures of the forest…and to us. We will bring you updates on the travels of the turtles here on this blog in the form of photos, videos and maps. For more information on the Turtle Tracks project scroll back in time within the pages of the blog to read my posts and follow in Turtle Tracks! Snake Tracks, like Turtle Tracks, is also a wildlife conservation, research and environmental education program that is studying the Timber Rattlesnake. Currently, we are following the movements of two wild rattlesnakes with radio telemetry techniques in order to learn more about their natural movements in the deep forests near Earthshine. We have named the male snake Utsa’nätï –the Cherokee word for rattlesnake–and the female snake is named Zoe*. We plan to follow them for several years in order to learn all that we can about their travels and to educate you on the interesting, beautiful and greatly misunderstood life of the Timber rattlesnake. We will bring you updates on their travels in this blog in the form of photos, videos and maps but unlike Turtle Tracks we do not plan to take visitors into the field in search of these snakes or reveal their exact locations…for obvious reasons. For more information on the Snake Tracks project scroll back in time within the pages of the blog to read my posts and follow in Snake Tracks! Earthshine R&R is an Eastern box turtle rescue and rehabilitation program that provides care and a home for box turtles and other reptiles that have been injured due to encounters with humans and their machines, lost their homes due to habitat destruction, were former pets whose origins are unknown and also those animals whose injuries do not allow them to be released back into the wild. Non-releasable animals become residents of the Earthshine turtle enclosure and educate people on the value and beauty of these wonderful living jewels of the forests. Learn more about the R&R program by visiting our website. Outreach Programs. Earthshine Nature Programs will bring our animals to your school, camp, birthday party or other organization in the Western North Carolina community. A sample of our programs include: reptiles and amphibians, turtles, snakes, endangered species and wildlife conservation, keeping reptiles and amphibians as pets and our new indigenous music program–The Nature of the Didgeridoo. The Nature of the Didgeridoo: This is a unique program about the ancient Australian Aboriginal musical instrument the Didgeridoo. The Didgeridoo literally has its roots in the nature of the Outback of Australia and the sound and story of the Didgeridoo is unique and unusually beautiful and a must for all to experience. Steve will bring his Didgeridoos to you, tell you a part factual and part mythical story about the creation of the worlds oldest woodwind instrument while demonstrating how to play and then everyone will have the opportunity to construct their own plastic didgeridoo to take home. Earthshine Nature Programs is a not for profit organization and a separate entity from Earthshine Discovery Center. All donations to ENP are tax deductible. Our staff is volunteer so 100% of all donations are used to cover the operating costs of our in house and out reach education programing, wildlife conservation projects, animal care, wildlife rehabilitation work and equipment costs. Steve is from Hendersonville, North Carolina. 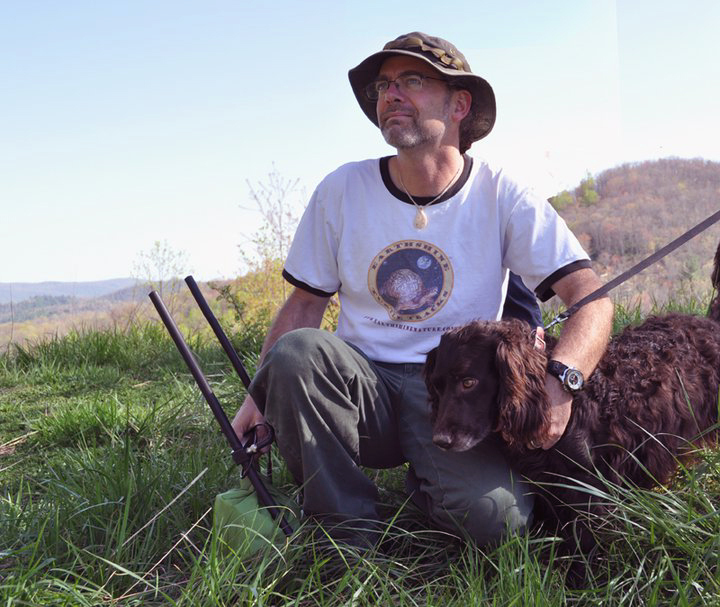 He spent his early years chasing snakes, lizards and salamanders all over the mountains of North Carolina. During his college years Steve studied wildlife and fisheries management and recreation management as well as zooarchaeology. Before discovering Earthshine Steve worked in many interesting positions at many well known private, state and national parks, private inns, camps and farms some of which include: The Great Smoky Mountain National Park, Hammocks Beach State Park, Chimney Rock State Park, Falling Creek Camp for Boys, Flat Rock Nature Center and Little Saint Simons Island. His job titles have included seasonal park ranger, back country trail ranger, interpretive naturalist, camp counselor, nuisance black bear, wild boar and rattlesnake trapper (no snakes were ever harmed) and aircraft mechanics assistant. Steve’s passions are reptiles and wildlife conservation and public nature education. He was greatly inspired to follow his dream of working with wildlife in his early years first by his parents Catherine and Clayton O’Neil who gave him a love for all things natural and real. Later Steve was influenced by Marlin Perkins and Jim on Wild Kingdom, Jacques-Yves Cousteau, Sir David Attenborough, Jane Goodall, Dian Fossey, Grizzly Adams, Marty Stouffer’s Wild America, Harry Butler Down Under, Joe Duckett, Charlie Green, Steve Irwin “The Crocodile Hunter,” Les Stroud, John Rucker, and most recently Captain Paul Watson of The Sea Shepherd Conservation Society. Steve has conducted hundreds of nature and wildlife presentations to thousands of children and adults over the years. He has lead many camper groups of youngsters and adults into forests, mountains, caves, swamps and dunes in search of all things and all places wild and wonderful. Steve is a volunteer wildlife rehabilitator specializing in reptiles and Opossums. He also puts in hundreds of volunteer hours keeping track of not only the several turtles he is following at Earthshine, but also for the North Carolina Wildlife Resources Commission’s Nongame-Endangered Wildlife program monitoring reptiles and amphibians and now bats. Steve edits this blog and hosts a Youtube.com site where he posts all of his nature videos. Find us on Facebook at Earthshine Nature Programs. learn more about Earthshine Discovery Center. Hey Steve give me call about the Didgeridoo program for schools . ..
JOIN US for our SPRING BENEFIT EVENT!